Well, it's time to get ready for another adventure! Though not quite as big as the last one - you might remember us from the Victoria, BC to the Sea of Cortez thread - there are plenty of projects in the works to get the boat ready for this summer's circumnavigation of Vancouver Island. With less than four months to go, it already feels like we're behind the eight ball! - Complete electronics upgrade. The fish finder and radar were 1980's vintage (think big CRT screens) and have already been removed and sold off. I'm currently pricing out a complete SimRad package (2 x 12" MFDs, 4G radar, ForwardScan sonar, autopilot (finally! - we hand-steered all the way to Mexico), and AIS transceiver to upgrade from the current ICOM receive-only device. - The old wooden mast and support wires were removed, which will open up a huge amount of space on the fly bridge. I'm looking for quotes for a stainless steel arch based on this Beneteau design. - The fly bridge deck will be re-surfaced (the non skid is cracked and peeling) and the seating will be removed and upgraded. We'll finally have a proper captain's chair instead of a bench, and we're looking at some nice teak furniture for lounging around. - The Ford Lehman's injectors have already been removed and are currently being serviced. Also going to do the valve clearances which I've never done before (shame)! - I've already purchased and received an RS11 from Noland Engineering to digitize all engine data and feed it to the NMEA 2000 network (inspired by this thread). I'm looking forward to being able to set warning and alarm parameters at whichever values I please, which will reduce some of the stress of cruising. - The old, crappy, moldy foam mattress in our main cabin is finally going in the dumpster. It was actually made up of three separate layers of foam which I can only imagine were added incrementally by the PO(s) to try to make it more comfortable on the cheap. A brand new, custom fitted, latex foam mattress (if you're in the Victoria area, talk to these guys at Fawcett Mattress) should be ready by the end of this week. The Froli System box spring has already been installed and fitted in an effort to reduce condensation in the winter. - Our original 1980's fridge/freezer is also gone, with a new stainless drawer-type on the way. It's about half the height so some cabinetry work will be required. Unfortunately it looks like the old cabinets were screwed AND glued so it's going to be a big job to rip everything out. Still not sure if I'm going to try to DIY or bring in a professional. Probably a professional. There are numerous other projects on the list that are a slightly lower priority but those are the big ones. We haven't fired up the watermaker in nearly two years so hopefully that still runs alright. I'm also hoping to get my HAM license knocked off so we can use the HF radio during the trip (didn't need the license to use marine bands in Mexico). Good to see you back on the forum VicTrawler. Looking forward to following your adventures. Sounds awesome - all of it! I'm also in Victoria, and after a lot of research am about to place a mattress order with Fawcett Mattress. Nice to hear someone else feels its the right product - expensive but looking forward to it. I was sold on it after talking to Duane for a couple of minutes. I think it'll be a big improvement over traditional foam. We'll have it on the boat by the end of the week or early next so I'll be able to give you some feedback shortly. You will have a tremendous trip, and this will be a great thread! Hopefully we can cross paths during our "inside half-loop" during the last 2 weeks in June. We might just return down the outside - we shall see. Always happy to meet up with TF members! Nice boat! I'm definitely thinking about documenting the refit work, but probably not the trip. I think a lot of the refit material would be unique/original and of interest to older trawler owners. Booked the haul out today. May 2nd at Westport Marina in North Saanich. Heard good things from some of the residents of our marina. That will give us nearly a month to get everything done on the boat that I can't do while it's in the water. That is a very good and complete list of work and upgrades. What group will be doing it? Where will your vessel be when in North Saanich area? I'm project-managing the work myself, so I'm in the process of sourcing quotes for the various jobs. Westport is great in that they allow outside contractors to come in and work, so you're not limited to their pool of staff, not that there's anything wrong with the work they do. In the end I wouldn't be surprised if most of the work is done by Delta Marine which is based in the yard. All depends on what they want for the work. The boat will be on the hard at Westport, otherwise we'll be at our home marina in West Bay (Victoria) or underway on our trip! There's A LOT of room up top. We're really going to have to put some thought into how to best use the space. 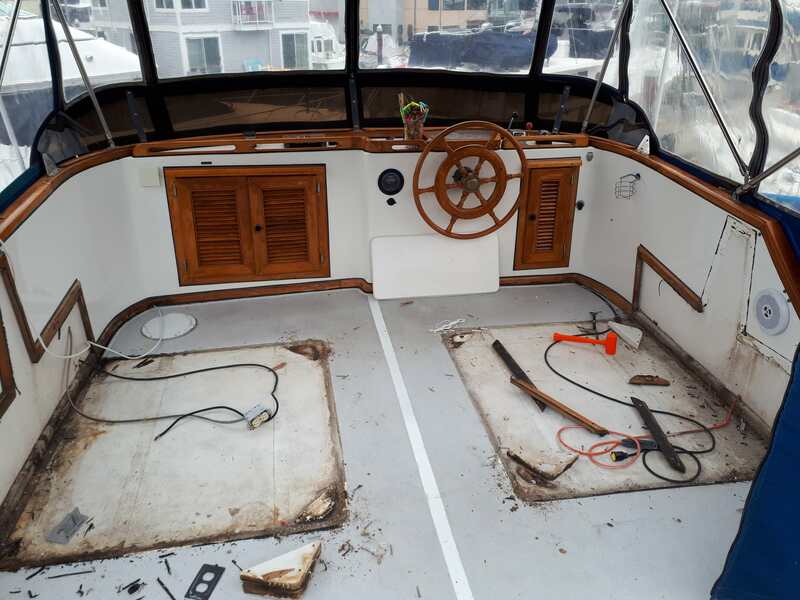 Just completed a similar project on the flybridge, teak out, cut out soft spots, went back with on the deck with glassed coosa board. 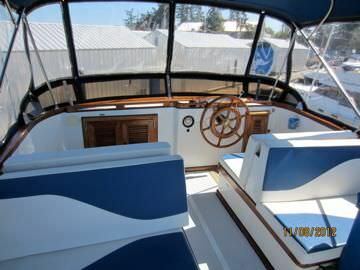 Refinished the deck with slick coat and non- skid, cut the front seats out making room for 2 new helm seats . . . Modified electronics console and added 12” Garmin recorder/plotter and will add iPad next to it. Very nice! Just curious, how did you secure the pedestals for the helm seats? Did you have to bolt right through the deck? I'm assuming I'm going to have to pull back the material on the ceiling of the saloon and bolt right through. Exactly, the coosa board core on the deck gives much better stability to bolt into and used starboard backer in the saloon ceiling as added support. Should be good for the long haul. Having comfortable seats make cruising more enjoyable. Thanks and have fun with your project. I can't imagine hand steering to Mexico, I once did it for a day on the ICW and was ready to kill myself. I also still have not adjusted my valves, but I will, soon. I promise. My only question is your route. now, I know nothing of B.C., but am wondering if by taking the west side of Vancouver Island in early June, it would be more susceptible to large swells and more storms than a month later? What did you pay for the mattress? We'll cross paths in 2019. Good luck. This is a great trip - it's the best of both worlds with the west coast remote, wild and at times challenging, and the inside, full of great boating folks to connect up with along the way. I think we were just so excited to be going to Mexico (and every port in between) that we didn't mind hand steering. It gave us something to do. We'll be doing the trip counter-clockwise around the island, so we'll be coming down the outside in late summer. The mattress, including custom cover, was $1800 CAD (~$1400 USD). Good question, and as Vic indicated doing the trip CCW keeps the seas astern or quartering off the starboard aft. There is very good weather forecasting and lots of places to duck in from Barkley Sound up to Cape Scott. But those coasters coming across the North Pacific can gain lots of steam even if the local weather forecast is OK. Buoy data watching is interesting.